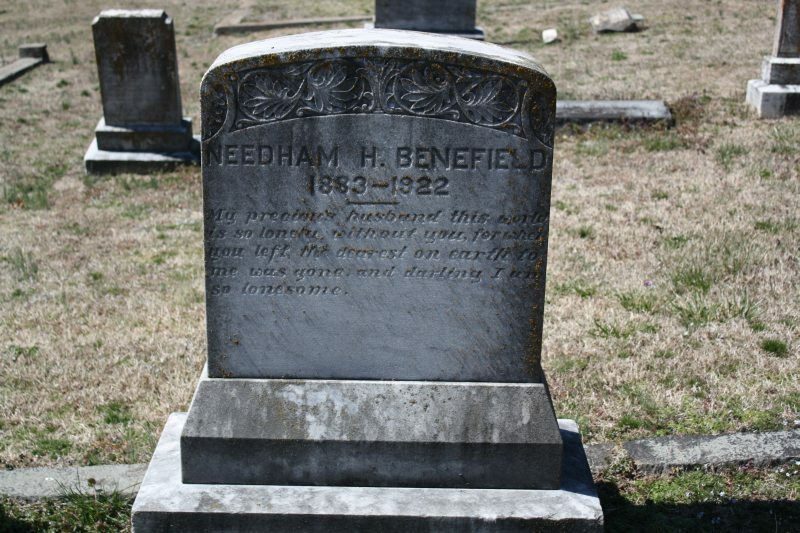 Needham Henderson Benefield’s marker in Leemont Cemetery bears an inscription which illustrates the grief his death left his wife, Bessie. Needham was born in either Georgia or Alabama (records vary) in 1882 or 1883 to William G. and Elizabeth Brumbelow Benefield. Sometime in the 1880s the Benefields moved to North Danville where William worked in the mercantile business. While Needham’s marker lists his birth year as 1883, a draft registration card gives his birth date as October 31, 1882. By the time the 1920 census was taken he had remarried Bessie Walker. His son is not listed in the household on that census, but because William would have been 18, it’s possible that he had already moved out. The William M. Benefield listed in the directory below was Needham’s brother. Needham’s health problems began by May of 1922. That month there was a blurb in the local newspaper about his wife traveling to Tennessee, where he had been hospitalized. He had gone to Georgia to visit his brother William, perhaps on business, around October 1922. According to information on Needham’s Find a Grave memorial, his health was declining when he arrived at his brother’s. On November 23 he passed away, with his body sent back to Danville the next day on a train. 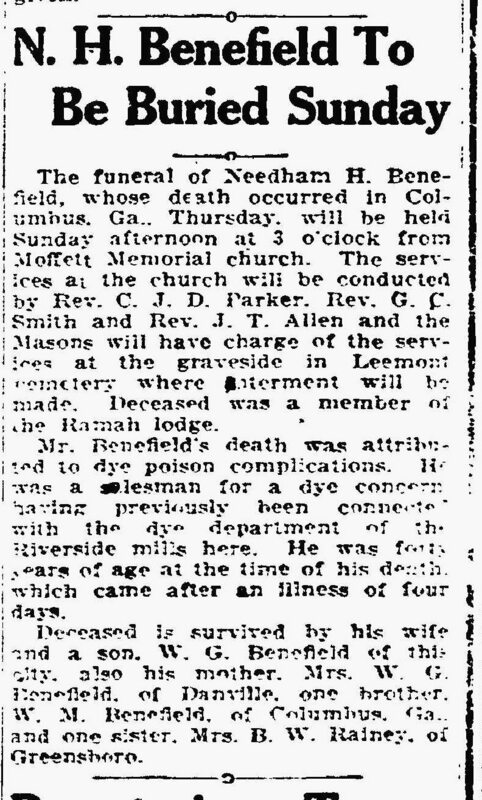 His obituary from the Nov. 25 issue of The Bee states that his death was the result of “dye poisoning complications.” I did some research on the health hazards faced by employees working in the textile industry and poisoning from dyes used was a daily risk. Workers faced danger from explosions due to chemical reactions as well as poisoning from inhalation of fumes or dust produced by and absorption through skin contact with the toxic chemicals used in textile colorants. Depending on which compound he was exposed to, the severity of his poisoning, and the method of his exposure, his symptoms could have included: central nervous problems (including paralysis), weakness, vertigo, irritability, rapid pulse (a weak pulse for more severe cases), an unusual pallor, dermatitis, discoloration of the eyes, digestive and kidney trouble, cyanosis, constant sneezing, blood poisoning, mucous membrane irritation, muscle pain, pustular skin lesions, loss of appetite, vomiting, and diarrhea.1 Those symptoms were based on toxicity due to aniline manufacture and aniline dyestuffs, but American Aniline also produced a number of other dye products. Needham was but one of the many, many people who worked in Danville’s textile industry during the time when such an industry actually existed locally. It makes you wonder how many others died as a result of industrial poisoning.